The creation or strengthening of user groups is a key element of most community planning. They act as clients in championing the views of those who will use the end product and keep the momentum going, often for many years. User groups should be as representative as possible of the end users of any initiative, including as many interests and viewpoints as possible. Initially user groups are likely to be informally organised and dominated by self-selected enthusiasts. As projects develop, the groups may need to become more formally organised with democratic voting procedures and, perhaps, legal status. For larger projects, several different groups may be useful at various times and groups will have sub- groups and working parties for specific issues. top: Lightmoor, UK, 1990, Tony Gibson. bottom: Shoreham, UK, 1997, Nick Wate.. Starting a new user group at a workshop. It is important to work closely with existing organisations but each project needs its own dedicated group. Otherwise projects simply become 'another item on the agenda' of an existing body and will probably be mediocre or flounder. If enough people are interested, set up sub-groups and working parties. The more people that can be involved and given roles the better. Make sure the nature of any group is clearly understood. It is always worth writing down 'terms of reference' setting out a group's purpose, powers, accountability, funding, meeting schedules, and so on. Main costs initially: printing and publicity. Most groups will raise money through membership fees and fundraising events. Informal issue-based campaigning group for interested individuals. Represents the interests of a geographical neighbourhood or cultural entity. Includes residents, workers, businesses, etc. Formally constituted organisation with a range of interests, usually with charitable status. Has development capability. Liaison body for representatives of constituent organisations and interests. May be area- or issue- based. Loose support network of people supporting a particular place or cause. 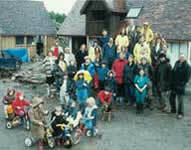 Organisation of people who want to build or manage housing together. Formal organisation for managing a project. Group set up to deal with one specific project (eg a new sports hall). Organisation representing residents in an area. Informal group set up to progress matters. Informal group dealing with a specific topic. advertising a meeting to set up a new group. People who might be involved in a neighbourhood improvement forum.